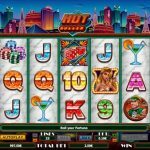 Hot Roller is a Las Vegas themed video slot game. The game was designed by NextGen Gaming and they have done a tremendous job by doing it so. The game starts with an image of the Strip on a dark night, just when all the action is over. So you have a private session with the Hot Roller here, so play your cards right. The blonde girl is the wild symbol and its function is to substitute for every other symbol to complete a winning line, and this comes with a nice animation where she blows you a kiss. The only symbol it cannot substitute is the scatter. But that is okay since the scatter activates the main feature, the free spins round. The rolling dice is the scatter here in this game and you need to land at least 3 to activate the feature. You can win up to 36 free spins with x6 multiplier. But that is decided before the free spins even start. You need to roll two red dice to determine the number of free spins, and then you need to roll two white dice to determine the multiplier. The extra good news is that you can re-trigger the free spins round as well. 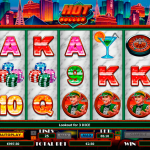 Hot Roller is definitely a video slot game that you have to try. Especially if you do not have the opportunity to visit Las Vegas, now the Sin City is brought to you with the latest game from Nextgen Gaming, so it is a chance that you need to grab before it is too late. The game is perfect in every aspect. We love the visuals and we love the special features too. They are all designed so you can land some good wins and finish the session happy. For another great engaging game you should consider playing Cherry Blossoms a 5 reel slot by NextGen.